The tightrope between security and freedom is the quest of most relationships, personal and political. Fashion is not merely a distraction, it's a way of creating structure, a seduction of images that counteracts the visual of Donald Trump and Theresa May holding hands at the White House in an international landscape that would make Caligula blush. Did she wash her hand afterwards? Or did she feel unsafe, knowing that the president didn't fancy her? I pondered those questions as I darted into Frith Street Gallery — which, just so it's easy to find, is located in Golden Square, London. With my short attention span, I'm not a fan of art installations, so I watched pigeons giving tourists a shite shampoo outside in the square until a sound like a vampire having breakfast lured me to the back of the gallery. The necrophagiac faces in the queue for Halloween nightclub stared at me like they want to drink my blood in a martini glass with a lemon twist. The emptiness of the gallery intensified the experience of being eaten by the eyes of strangers stalking me from the screen as my footsteps echoed on the stone floor moving between the four films of American Gothic 2017. I was compelled to pick up the price list. Not because I wanted to buy a vampire, but because I wanted to know the artist's name. Cornelia Parker, whose installation The Maybe of Sleeping Tilda Swinton is — maybe — my all-time favorite. Her work is distinctive but each piece is so different it doesn't scream her identity like an Emin or Hirst. Parker turns "the ordinary into the extraordinary" — or, in this show of new video works, American Gothic, she's turning the sinister into the seductive. The slowed-down soundtrack transforms city sirens into the lust call of ghouls, while the slow-mo films convert these "ordinary" faces into the devil's wee friends. "I love urban spaces ... I've always been an artist. Doesn't mean my art's any good!" Parker says. 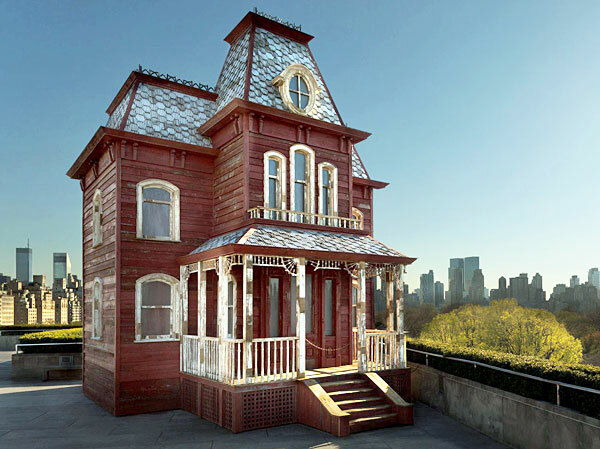 She shot American Gothic 2017 on impulse on her iPhone while launching PsychoBarn, her installation on the roof garden of the Met that hovered over New York City as Americans prepared to damn themselves with a president who looks like he's wearing a Halloween mask. PsychoBarn was a recreation of the house in Psycho, that American masterpiece made by an Englishman which has shaped our terror since last century. It's an almost romantic emblem in a world where reality feels more threatening than a slasher movie. 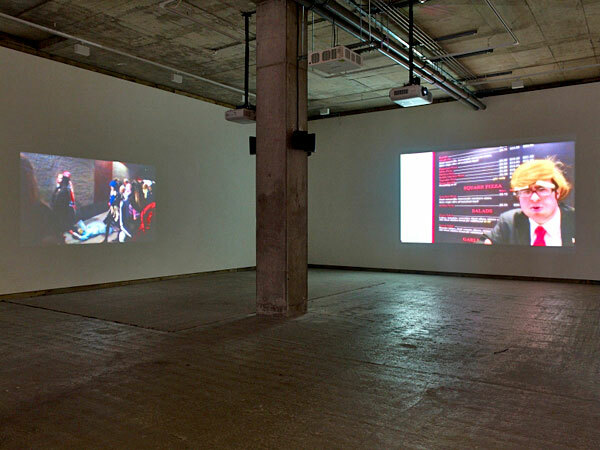 Having a face-off with Halloween night on the opposite wall of Frith Street Gallery was a crowd of Trump supporters who didn't need to be wearing Norman Bates' mother's wig to scare me. I'd run if they threatened to sit on me. Parker makes a brief appearance, Hitchcock-style, in the film series with her distinctive bob somewhere between Louise Brooks and Richard 3rd. I could have stood there for hours if the gallery hadn't been shutting. "Imagine what it's like...listening to that...mewling...all day," the gallerist laughed. But isn't that what we do? Listen to people whining about this and that on social media, 24-hour news, and at that mythic bus stop where strangers talk to each other? At least I'm deaf in my right ear; I only hear the bores on my left. But I can't wait to see what Cornelia Parker, who has been appointed UK Election Artist, produces from her stint on the hustings with Tessie May and the gang. As Parker says, "If I want to throw things off cliffs I just throw them myself."